Powder Hound Lodge is home to Buddy our border collie/collie mix. and Yogi our St. Bernard "pup." Yogi's still learning his manners. They're super friendly but a little enthusiastic at check in. * Is this vacation really going to be fun for your dog? 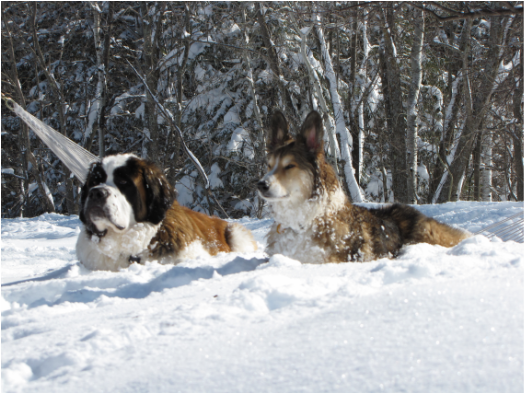 * Dogs are welcome when a group is renting the entire lodge only and with advance notice so we can relocate our dogs. * Ask your group organizer how many small children are coming and does your dog know and like every one of the kids? * They'll band together, run & yell your dog's name til he chases them. * Your pup will be greeted by a 175 pound St. Bernard, Yogi, who enthusiastically pesters him til he plays. * Dogs need to be with someone all the time so they don't scratch doors, bark, whine or poop in the lodge due to you having left them in a strange place for the day/evening. * If picking up poop in 20 degree weather before your morning coffee isn't your thing, then it's best to leave your pooch at home. * Housebroken - fully housebroken - dogs only. No exceptions. * Dogs cannot be on beds at the Lodge. Initially, we invited all dogs to visit and learned by trial & error that dogs act strange in strange places. If you have questions, please call. Happy to do what we can to help. If you do bring your dog. And we find out you didn't read the above, Airport Molly's is a great option and right up the street. It's like a spa day for everyone.